Previously Guido Möbius has mostly given lyrics a wide berth. On his last album „Gebirge“ Möbius’ strategy to avoid meaning and pathos altogether was the collaboration with Andreas Gogol with his wordless dada-song. And although Gogol’s highly musical stuttering is also present on Spirituals, Möbius now goes the other way on his fourth album: this time he’s allowing himself to indulge in meaning and pathos. „Spirituals“ unites crooked humour and dark premonition, apotheosis and kitsch. With each track Möbius highlights another aspect of spirituality, be it religious or another kind. Indeed, maybe one does come close to a feeling of transcendence through hypnotic rhythms. Maybe one can even achieve purification through noise or just take solace in singing spiritual songs. Möbius plays with the neo-pagan spirituality of Black Metal („all evil ways“) as well as with egocentric rallying calls of soul music („the right thing“). He evokes the spirits of the end of days („babylon’s falling“) and harnesses the touching confidence of an amateur choir („though the darkness gathers“). His pleasure in the unexpected is ever present in his music. Just as much as his preference for unusual sounds. Six of the nine tracks on „Spirituals“ use the texts from traditional gospels. Without knowing the originals Guido Möbius gave these lyrics new melodies and used them for his own purposes. This poaching on forbidden terrain was a special joy for Möbius the atheist. But in so doing its not about provocation or any shock tactics. Far more he has re appropriated something that is already firmly anchored in the collective consciousness. The citation alone suffices to expose principles of guilt, angst and humility. Spiritual music can be defined either as humorous, oppressive or double-sided even if it is unintentionally so. But gospels are also good when you want to enter a fully authentic emotional state with no trace of irony. They are sympathetic and when sung in a collective, a source of genuine spirituality. Following two albums of predominantly chamber music, Möbius finally approached bass and bass drum driven music with „Gebirge“. And the Berlin based musician with his roots in the Rheinland also uses the instrumentation of modern dance music on „Spirituals“. Although stylistically he still can’t be pigeon holed. On „godhead appears“ he combines fevered percussion with Kiki Bohemias elegant singing and Andi Otto’s cello playing. On „babylon’s falling“ we hear layers, stacked like geological sediment and streaked through with a restless pulse. The rhythmic saws and squeaking sound on „all evil ways“ combine with the morbid groove. Then there’s „judgment“ with its dry funkiness and „blessed sleep“ with cutting guitar layers and noises of all kinds. The echo effect on „the reign of sin“ lets loose whispers from ghostly voices. While most of the sounds on „all around me“ come from the automatic tuner on an everyday portable radio. This album has a light and a dark side. A fact that is most conspicuous in the LP format. The hopeful A-side with „all around me“ to „godhead appears“ could be understood under the motto redemption, whereas the B-side is more dedicated to damnation. Guido Möbius works as a PR agent and runs the music publisher autopilot. On his 7“ label emphase records he releases records at irregular intervals which are always recorded using only one instrument. Early 2012 the split LP „asper 2“ featuring re-edited concert recordings by Guido Möbius and Centenaire + King Q4 came out on dokidoki / clapping music & guilty by association. 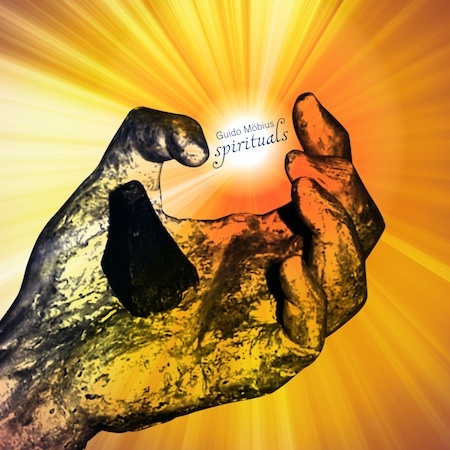 „Spirituals“ is Guido Möbius’ fourth studio album.